Make amends for breaking the College of Winterhold rules. "Ah, yes. There was an incident, wasn't there?" This quest will automatically begin after killing another College member. The quest description will inform you that you have been suspended from the College. 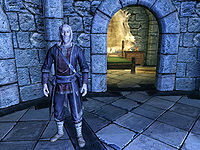 It is a very short quest, requiring you to only find Tolfdir in the College and speak to him. Tolfdir lectures you about behaviors that the College finds inappropriate, and states that he will have your suspension lifted if you pay a fine. Paying the fine results in immediate reinstatement into the College's ranks and completion of the quest. This quest may begin even if you have completed the College of Winterhold questline and became Arch-Mage. Murder is the only crime that will trigger this quest; lesser crimes, such as pickpocketing and theft, will not. The fine for the first incident is 250 gold. If you commit another crime and receive the quest again, the fine climbs to 500 gold. It increases to 750 gold for the third incident, and 1,000 gold for each incident thereafter. Tolfdir increases the amount of the fine according to the number of past incidents, not their severity. Therefore, as long as it's your first such incident, you can murder a non-essential member of the College and only have to pay 250 gold, one quarter of the bounty that would be charged in any hold for murder. Tolfdir may instead be found in Saarthal if you are between starting Under Saarthal and finishing Hitting the Books. J'zargo and Onmund will not trigger this quest if killed. J'zhar will incorrectly trigger this quest if raised and then killed again. Endrast will also trigger this quest if raised and killed. 200 Finishes quest I have paid Tolfdir and my suspension from the College has been lifted. On the PC, it is possible to use the console to advance through the quest by entering setstage MGRejoinQuest stage, where stage is the number of the stage you wish to complete. It is not possible to un-complete (i.e. go back) quest stages, but it is possible to clear all stages of the quest using resetquest MGRejoinQuest. This page was last modified on 25 January 2017, at 05:23.